The annual cicadas have emerged and are vibrating their tymbals at arboreal drumming circles around town. The beats bounce and reverberate against hard city surfaces; during a crescendo, I swear I can feel the buildings and sidewalks pulsing like a heart, like wings. Yet, despite the percussive nature of this invertebrate orchestra, to my ears the cicada’s summer song evokes the kokyū—a traditional Japanese string instrument played with a bow. This may be due to the fact that I imagine cicadas as miniature ronin, masterless six-legged samurai, stoic and single-minded, clad in intricately constructed armor of lacquered plates and scales. Of course, several beetle species call to mind this 12th-century warrior class, and I’m not the only one to see the resemblance. 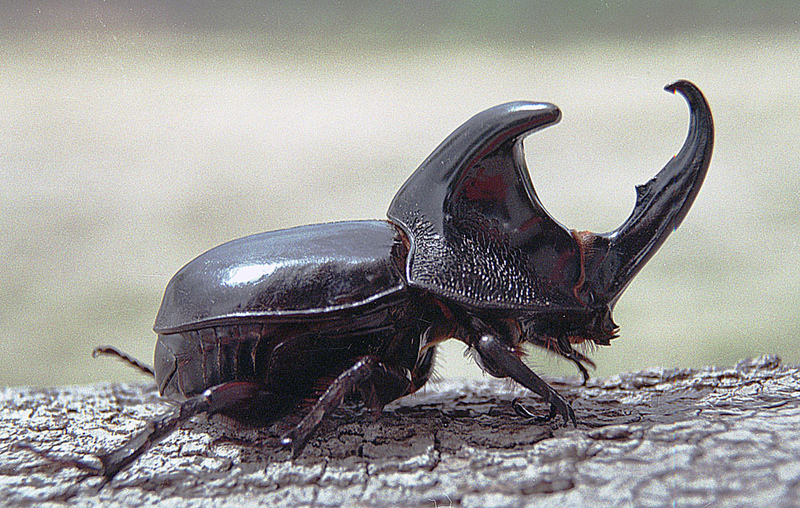 Rhinoceros beetles (Allomyrina dichotomy), for example, are known in Japan as a kabutomushi—mushi, the Japanese word for insect, and kabuto, which refers to the helmet worn by samurai (and the inspiration for Darth Vader’s visage). It may be an example of the sincerest form of flattery or an unconscious imitation, but biomimicry—biological features or processes used as inspiration for beneficial products and practices—is an old technique that’s experiencing a resurgence. Humans have long taken cues from the successful strategies of other animals. Indigenous cultures incorporated the characteristics of nonhuman animals into hunting tactics and rituals; composers have used all manner of musical instruments to simulate birdcalls and other nature sounds; superheroes like Spider-Man and Batman are pretty shameless about co-opting the special powers of their totem animals. Then there’s warcraft. It’s hard to miss the resemblance between certain insects and the body armor worn by human warriors. From my perspective, there’s a natural synergy between invertebrates, who need a rigid external sheath for support and protection due to the absence of an internal skeleton, and Homo sapiens, who need prosthetic exoskeletons to protect our vulnerable bodies from the increasingly deadly technology imagined and fashioned by members of our own species—first flint arrowheads, then copper maces, bronze spears and daggers, iron javelins and swords, cannons, shrapnel, steel rifles and handguns, and eventually weapons that make any kind of armor irrelevant. Chemical warfare is common in the insect world, and humans have readily adopted the same strategy against both macroscopic and microscopic opponents. In human enterprises, poisons do generally deliver short-term success; however, the win is usually followed by long-term health and environmental losses. This is particularly true when chemistry is used against presumed enemies with high reproduction rates—for example, insects and bacteria. In most biological populations, there will usually be at least a few members strong or lucky enough to survive the application of toxins. Those individuals become the progenitors of the next generation, passing along their protective genetic code and, over time, rendering the chemical weaponry powerless. That’s how natural selection produces organisms well suited to their environment, and that’s why chemical deterrents always have a limited shelf life. Less than one hundred fifty years after the introduction of antibiotics, hospitals and medical personnel are fighting resistant bacteria, including methicillin-resistant Staphylococcus aureus (MRSA) and multi-drug-resistant Mycobacterium tuberculosis (MDR-TB), and attempting to do so with a limited alternate arsenal. As a result, biomimicry is shrinking to nano-scale. Researchers are investigating new ways to protect human bodies from bacterial enemies, and certain insects have proven to be adept at mechanical antibacterial warfare. Think samurai on a microbial level. In 2013, a team of researchers from Australia and Spain discovered that evolution has armed the clanger cicada (Psaltoda claripennis) with an elegantly simple defense against infection worthy of a kendo master. Clanger wings are covered with nano-pillars—aka tiny spikes. Initially, it was assumed this pointed texture worked like a bed of nails—a hapless bacterium lands on the wing, stretching and sagging into the crevices between the spikes, and as gravity does its thing the pathogen’s skin tears, rendering it incapable of reproduction. Earlier this year, though, a group of Australian and Nigerian researchers proposed that truth is, once again, stranger than fiction, or at least as inventive as a movie villain. Bacteria adhere to surfaces and each other by secreting finger-like structures called extracellular polymeric substances (EPS). These natural polymers allow the organisms to form biofilms on plant roots and fruit, fish and boat hulls, teeth and gums, plumbing pipes and medical catheters, even hot alkaline spring waters and glaciers—in other words, nearly any surface we know of except a nano-textured insect wing. 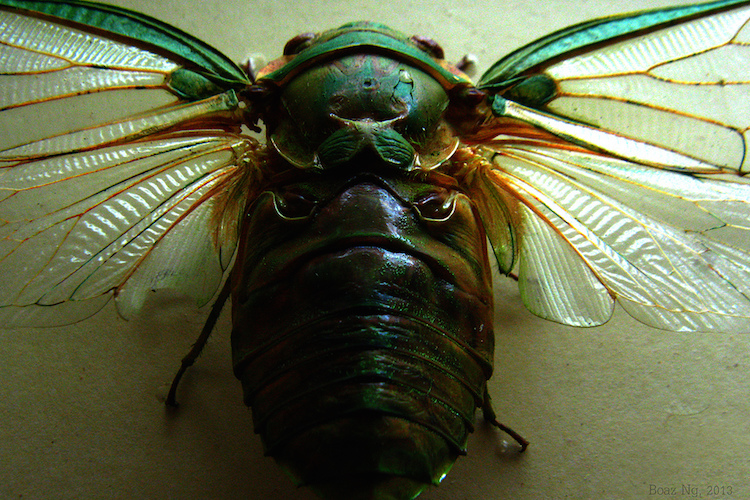 If the bacteria on a clanger cicada wing would stay put, they would likely deform but survive. If they move, though, those pillars subject the EPS to shear forces, ripping the external membrane and causing the bacteria to deflate like a balloon due to fatal leakage of the cell’s contents. Regardless of how these nano-textured surfaces (NTS) kill, their potential as models for developing chemical-free, non-toxic antibacterial materials is undeniably exciting. One of the first proposed products to utilize NTS was a coating that could be applied to countertops, doorknobs, railings, bus straps, subway poles, sinks, commodes, and even money. An Australian manufacturer of medical implants has acquired the patent, seeing potential for using this technology to reduce the chance of post-surgical infection. Since the killing mechanism is mechanical, devices coated with nano-textures could bypass the clinical approval processes required for chemical treatments, reducing the time and cost to bring these products to market. Additional research has revealed that clanger cicadas aren’t the only winged insects armed with antibacterial nano-patterns, nor are they the most efficient. 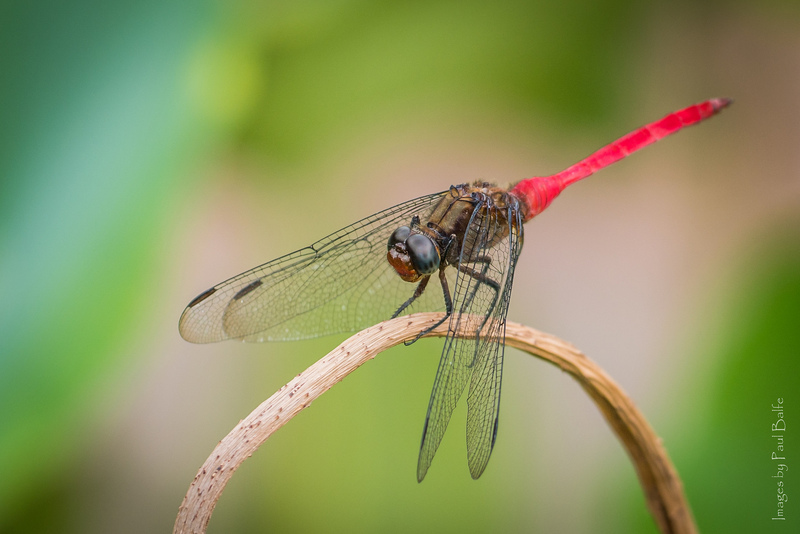 The cicada’s NTS only kill gram-negative bacteria, but the wings of a fiery skimmer dragonfly (Orthetrum villosovittatum) have NTS that are equally effective at killing both gram-negative and gram-positive pathogens. The nano-scale needles formed by black silicon have been tested in the lab and appear to have antibacterial properties similar to those of dragonflies wings. However, scientists aren’t yet sure why nano-patterned wings provides such a powerful defense, or how to replicate it for commercial use. That should come as no surprise given the nature of warfare, on any scale. It’s the Way of the Sword, and a samurai never reveals all of his secrets. Every summer, people complain about cicadas but if insect wing nano-pillars become the next Penicillin they may change their tune. Personally, I find the droning soundtrack soothing. I like knowing that, aided by sodium-yellow streetlights, spineless samurai are keeping watch through the night. Their kokyū lullaby floats past the gingko tree leaves, slipping through my window screen and into my dreams.